Laurel Candelario has been hosting the Fairy Princess Makeovers at Relay for Life in honor of Megan Carpenter for 13 years. This year, Candelario is Relay’s honorary survivor. Megan Carpenter was 11 years old when she was told she had adrenal cortical carcinoma, a cancer so rare less than one in a million people are diagnosed each year. Megan Carpenter’s brother Chad and mother Dana. Doctors gave her mere months to live, but Megan was able to turn that into a nearly six-year battle, using her positive attitude and faith in God to influence the lives of everyone she met. She died in 2006 and the hole she left in the heart of her community still still prevails. A few years ago Megan’s mom, Dana Carpenter, swallowed her fears of public speaking and shared a moving speech at Relay for Life about the legacy her daughter left behind. 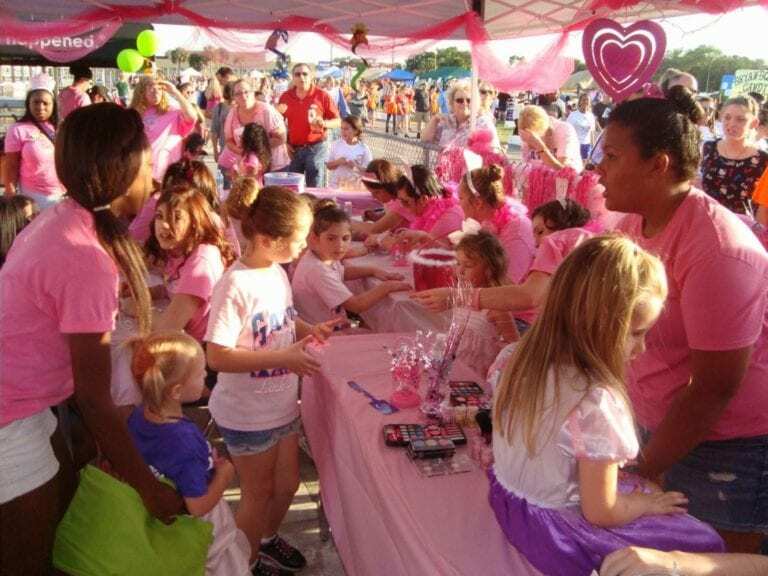 In Megan’s memory Laurel Candelario, a cosmetology teacher at Plant City High School, began hosting Fairy Princess Makeovers each year at Relay to help share Megan’s passion and joy with new generations in Plant City. Children are given makeovers for the special event and walk away with crowns. The makeovers are $10 and include nail polish, face painting, glitter for a treasure box of treats and crowning as a real fairy princess by the 2019 Florida Strawberry Festival Queen Kendall Gaudens, who is also one of Candelario’s students. Parents and loved ones are able to then take photos of their fairy princess at the end of the makeover. When Megan died, her entire community felt the brunt of the loss. The very next year, Candelario set up the Fairy Princess Makeover tent for the first time. Megan loved everything pink and princess-themed and Candelario felt it was a special way to honor her memory. Anywhere from 50 to 75 children come through the tent every year and the group has raised more than $100,000 since its inception. Candelario said it speaks volumes for how special Megan was as the community continues to rally in her honor every year. Her family and friends always show up and participate in the event to celebrate her life and the legacy she left. Each year the event grows and friends walk away as family. This time around, however, Candelario is experiencing Relay from a completely new and unexpected point of view. Laurel Candelario and her husband Rafael. When Candelario left the doctor’s office in October with her diagnosis she was bracing herself for what she knew would be the hardest battle of her life. Fate, however, wasn’t through. Her husband was diagnosed with cancer as well merely one month later. They had their respective major surgeries one day apart. The next few months were filled with trips to chemotherapy and the many stages of treatment. Though they were both in the trenches, they walked through it together. In a week they will walk the survivors’ lap together. Her husband Rafael is still undergoing treatment, but Candelario said he’s tough. As a retired Marine he’s using his resiliency to continue the fight and remains positive every step of the way. The support from family, friends, her school and the exceptional healthcare they’ve been provided at the hands of their doctors has helped them through the journey. When Candelario was approached to be the honorary survivor this year she said she was surprised, that there were other people that have “gone through a whole lot more,” but that she was honored to be able to hopefully inspire others on the night of the major event. The fairy princesses walk away with their own crown following a special ceremony with the Strawberry Queen. Candelario has been involved with Relay for Life for years and, up until last year when she received her diagnosis, was a team captain. Though she was undergoing treatment, when the time came to decide to host the Fairy Princess Makeovers or not she knew immediately they had to continue the tradition. When: March 29 from 7 p.m. to 8:30 p.m.